James Boburka consistently receives winning raves from his clients and colleagues commenting on his professionalism, creativity, friendliness, patience, and attention to detail. Clients clearly recognize his passion for his work, and are immediately put at ease by his collegial personality. His goal with every wedding is to provide the couple with a video that is so exemplary that it surpasses all expectations. James is the perfect combination of consummate professional and passionate artist. 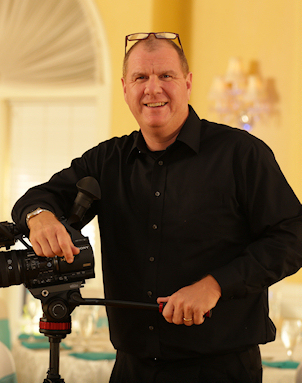 The technology utilized by James Boburka Cinematography to capture your perfect wedding day includes multiple state-of-the-art digital cameras that are excellent in low light situations. Using compact, high-quality equipment minimizes the need for external camera lighting. James also uses multiple high-quality audio sources placed discreetly throughout your venue. Using numerous audio sources ensures your event audio will match perfectly to the high quality of your video. What sets James Boburka Cinematography apart . . .
James films only one wedding per day. James's personal involvement, from the initial consultation to the final delivery of your wedding video, allows for a more custom video creation. James's artistic editing style creates a cinematographic video experience that will elegantly tell the story of your special day and make for a highly entertaining video. One of the most important and memorable days of your life. James Boburka Cinematography will capture your day in all its glory and create an heirloom that you will be able to enjoy for the rest of your life. In addition, imagine your wedding video being handed down to future generations, enabling your children and grandchildren to see "Mom and Dad" or "Grandma and Grandpa" on their wedding day! Contact James Boburka Cinematography today to discuss how we can provide you with your own heirloom video that you will be able to treasure for years to come.